After you finish taking Practice Exam 2 in Chapter 22, spend some time going through the answers and explanations I offer you in this chapter to find out which questions you missed and why. Even if you answered every question correctly, read the explanations in this chapter because I sneak some tips and warnings into the explanations to be sure you’re ready-set-go for the actual SAT. If you’re short on time, you can quickly check your answers with the abbreviated answer key I provide at the end of the chapter. You can handle this essay question in a couple of ways, but the first quotation gives you a huge hint about the SAT graders’ expectations. As you know, the atomic bomb exists, and not everyone is happy about it. J. Robert Oppenheimer, the author of the first quotation, helped create the bomb (a fact you get from the test question). He later had second thoughts about his work, but you don’t have to know this fact to write a good essay. What you do have to know — and reflect in your essay — is the complexity of the situation. Because the SAT graders don’t quote the inventor of, say, cancer-fighting drugs, they expect you to say something about the drawbacks of the human urge to discover and invent (such as the fact that people can now blow up the entire planet). At the same time, though, the test graders are unlikely to smile upon an essay that declares that the human race should be content with couch-potatohood. Introduction: State your thesis: Human beings need to stretch the body of knowledge. Without human restlessness, everyone would still be living in caves eating uncooked twigs. However, scientists must consider the probable uses of their discoveries. Body Paragraph 1: Describe some of the wonders created by science, including advances in medicine and technology. Avoid the essay trap of example overkill. You have literally millions of examples at your disposal for this topic. Be careful not to turn your essay into a giant list. Choose one or two strong examples and explain how they support your thesis. Body Paragraph 2: Discuss some drawbacks of the examples from the preceding paragraph. Modern medicine, for instance, can prolong life way past the point when it’s worth living. Technology has not saved human beings from pollution and has taken away some of the personal interactions that raise the quality of life. Conclusion: No one can foresee everything, but scientists should take reasonable ­precautions to control the results of their work because they have the power to affect millions of people for good or evil. Introduction: State your thesis: Although artists create in order to express themselves, they should consider other factors, such as the effect of their work on society, when they make art. Body Paragraph 1: Explain the benefits to an artist of self-expression. Discuss the way in which new artistic movements — cubism, for example — often shock audiences when they first appear. If artists create only works that please the audience, the artists sacrifice too much. Body Paragraph 2: Concede the fact that artists don’t work in a vacuum. If artists’ work supports stereotypes or hateful ideas, they can harm real people with their creations. The art of the Nazi era or the racial stereotypes in early 20th-century American films, for example, fueled and justified prejudice and discrimination. Conclusion: Conclude with the idea that artists must balance their personal need to express themselves freely with their obligation not to harm society. Freedom and responsibility go hand in hand. Now that you’ve seen a couple of different options for how to organize an essay addressing the obligation an artist/scientist should have to the public good, it’s time to score your own essay. Before you get started, turn to Chapter 8 and read the samples there. Then score your essay using the scoring rubric in Chapter 7; be honest with yourself as you determine how your essay matches up against the rubric. 1. C. Process of elimination (and perhaps some life experience in being ignored by a boss or teacher) gets you through this question with ease. How would you feel if you were the vice president in the question? Not buoyed (spirits lifted), reassured (calmed, given confidence), orinspired (stimulated, stirred by ideas), I’m sure. Intimidated (threatened) is a good match — far better than the overly general affected (influenced). 2. B. The word that probably pops into your head as you read this question (and I don’t mean “lunchtime!”) is unification. But that’s not an option. The closest choice is integration, which is more or less the opposite of Choices (A), (C), and (E), so, if you’re stuck on this question, you can guess using process of elimination. Choice (D) is somewhere on Mars because you can’t make a proclamation into something (a proclamation is an official declaration). 3. A. Okay, you can dump Choice (D) immediately because real-world knowledge tells you that angry people don’t hand out promotions. Choices (B) and (C) are also wrong because losing insignificant or outdated material won’t send any detective for ulcer medicine. Choice (E) isn’t bad because affront means “to insult,” but Choice (A) is better because crucial fits the sentence better than adverse. (Crucial means “essential” and adverse means “unfavorable” or “harmful.”) In case you were wondering, to upbraid is basically to yell like a drill sergeant during basic training. 4. C. If the corporation is affluent, it’s making lots of money, and lucrative means “profitable,” so Choice (C) fits the context of the sentence. On the other hand, Choice (A) doesn’t make much sense in terms of context, although the SAT writers want you to relate deregulated(removing or without rules) to multifaceted (lots of variety). Choices (B), (D), and (E) are nonstarters because their word pairs are opposites, and the sentence calls for similar words. To help you understand why Choices (B), (D), and (E) are wrong, consider their definitions. Mor- or mort- relates to death. (Think mortuary, morbid, mortal.) In the context of the sentence, moribund means that the corporation is so stale that it may as well be dead. Innovative contains the root nov, or new. Scrupulous applies to the kind of person who follows every rule and considers every aspect of morality, no matter how tiny — not a good pair for unethical, which means disregarding ethics (principles of right and wrong). 5. E. If the teacher is pragmatic, she’s practical. She wants to get the job done (to increase her students’ knowledge and understanding). So motivated (giving reason to act) fits this sentence best. A close second is Choice (B), but heighten intensifies feelings, so it’s a poor fit for studies. Choices (A), (C), and (D) are the opposite of what you want. 6. A. Notice the and in the sentence? That word tells you to look for a continuation of meaning, not a change in direction. The first half of the sentence talks about variety, and myriad means “various, diverse.” Convoluted (complicated or elaborate) and versatile (multitalented, adaptable) are there to lead you astray because both contain an element of variety, but myriad is the best answer. Intuitive (relying on instinct or gut feeling) and nebulous (cloudy, vague) aren’t in the running. 7. D. The clue here is furthermore, which tells you that the two halves of the sentence more or less match. If Lucy is saving the rain forest, she isn’t trying to wipe out (annihilate, decimate, and eradicate) Bambi and friends. Proliferate sounds good, but you can’t proliferate something else. The animals can proliferate (reproduce) all by themselves, but Lucy can only preserve them. 8. E. You can crack this sentence by filling in your own word. Irresponsible comes to mind, at least to teachers like me. You may say slow or reluctant. Of all the D words in the choices, only dilatory (tending to delay) fits the why-should-I-do-it-now-when-it-isn’t-due-for-two-whole-hours attitude portrayed in the sentence. Diligent (responsible, hard-working) travels in the opposite direction. Doleful (sad), doctrinaire (rigid in belief), and diffident (shy) don’t make sense in the sentence. The key to Question 9 is to think of the real world. What does the audience give to a good or bad performance? After you answer that question, look for pairs that fit. A conventional performance is stale and boring, so it will gather a lot of critiques (detailed criticism), not a few. An effective performance (one that does the job — that is, entertains the audience) receives many, not few, ovations (rounds of applause). The same goes for Choice (C). Because this question is the first one after the passage, the odds are that the answer is in the first few lines of the passage. As you’ve probably guessed, questions toward the end may refer to the end of the passage. However, this general guideline goes out the window for questions that take into account the entire reading selection. 11. D. Did the SAT writers trip you up on this one? When you think of hysteria, you probably picture out-of-control laughter that brings forth a slap (“for his own good”). But Lines 11–12 mention Choice (E) amnesias, Choice (B) paralyses, Choice (C) spasms or involuntary movements, and Choice (A) anesthesias. Only laughter is missing from the passage, so Choice (D) is your answer. Real-world knowledge helps on the SAT, but the final answer must always make sense in the context of the reading material provided. 12. C. The passage defines psychological as a state with “no discernable physical causes.” Choice (C) comes the closest to this definition. 13. A. Paragraph 2 says that Charcot clarified the psychological-traumatic nature of symptoms and mentions survivors of train wrecks, so you can choose Choice (A) with confidence. Choice (C) is a favorite SAT trap: It contains a statement that actually appears in the passage but doesn’t fit the question. Beware of such traps! 14. A. The term hysteria comes from the Greek word for “womb,” and the passage implies that it was once thought to be only a female disease. Hence, of both sexes counters that idea. Choice (A) is the right one. Also, Line 81 mentions the old link between hysteria and women. 15. B. According to Lines 42–44, Charcot says the railway spine and railway brain were cases in which “symptoms mimicked those found after spinal cord or brain injuries.” This question is chock-full of little traps. Choice (A) tempts you because it mentions trains, and Choice (E) may grab your attention because Charcot did use hypnosis. But Choice (B) fits best. 16. E. Lines 62–64 tell you that memories blotted out by physical injuries to the brain couldn’t be retrieved by hypnosis, so you know Choice (E) is the right answer. 17. B. Charcot’s hypnoid state is linked to the term dissociation, which is clearly defined as a blotting out of certain memories. Line 67 says that patients aren’t aware of what they’re doing, so Choices (D) and (E) aren’t acceptable. 18. A. The last paragraph lists several of Charcot’s accomplishments, but the word genuine immediately sets up a comparison. If the accomplishments discussed in the passage are his genuine ones, Charcot must have made some unsupported claims or performed some doubtful research. 19. D. The runner-up is Choice (A) because Charcot did treat hysteria with hypnosis. But Charcot worked in the late 19th century, and Choice (A) contains a present-tense verb (is). Medicine has certainly changed in the last hundred years or so, and for this reason, Choice (A) doesn’t measure up. Choice (D), on the other hand, is supported by Lines 24–25, which refers to so-called hysterics. 20. D. The author presents just the facts in the passage, and thus the tone is best described as informative. 21. A. Choices (B) and (E) are too broad, and Choice (C) is too narrow. Choice (D) doesn’t make the grade because the passage doesn’t tell you anything about Charcot’s life. Only Choice (A) remains. 22. D. The light isn’t new or old, according to the passage. It just travels different distances. So depending on what you’re looking at, you’re seeing different times. 23. E. The first four choices are too general. Direct Study of the Past, Choice (C), may be what I do when I clean out my pockets after a night out with friends, but it doesn’t explain what the passage is about. Choice (E) is the best option because it tells readers what to expect from the passage. 24. B. The passage states that the monument wasn’t built to study the sun because only “the first part of the answer is correct.” The author also explains that no one yet knows what astronomical phenomenon Stonehenge was built to observe, so Choice (B) is the best answer. 25. D. Choice (E) is the runner-up because the author is attempting to explain Stonehenge’s purpose. However, the comment inside the dashes is simply clarifying the meaning of the first part of the answer, not giving a theory all by itself. Therefore, Choice (D) wins the prize. 1. E. Plugging 5 and –4 into the equation p(p – q) gives you (5)(5 – –4) = (5)( 5 + 4) = (5)(9) = 45. 2. D. The easiest approach to this problem is to start at the end: Katie used her $10 coupon and paid $35, so the price was $45 without the coupon. Because this price was 50% off the original price, it originally cost twice as much, or $90. 3. A. Ratio is just a fancy name for fraction, so this problem says that k⁄m = m⁄n. Cross-multiplying gives you kn = m2, or Choice (A). 4. C. The key to figuring out this problem is noticing that the line containing points O, P, and Q is a diameter of the large circle and that it also contains the diameters of the two smaller circles. So the diameter of circle O equals the sum of the diameters of circles P and Q. Meanwhile, the line segment PQ is composed of the radii (plural of radius) of the two small circles. Because these two radii add up to 6, the diameters of the small circles add up to 12. The diameter of circle O is 12 and its radius is 6. Finally, because the circle’s area is πr2, the large circle’s area isπ(6)2 = 36π. 5. B. All the answer choices involve multiplication, and the only way to get an odd number as the answer to a multiplication problem is to multiply two odd numbers. Thus, you can throw out Choices (A) and (E) right away because you multiply by e in both of them. Choices (C) and (D) are also no good: If o is odd, o – 1 and o + 1 are both even. These calculations leave you with Choice (B). As always, check to make sure that your answer really does work. An odd plus or minus an even is always odd, so both o – e and o + e are odd, and the product must also be odd. 6. C. From 10:45 p.m. to midnight is 1 hour 15 minutes, and from midnight to 2 a.m. is another 2 hours. Thus, the train was moving for 3 hours 15 minutes minus the 30 minutes (1⁄2 hour) it was stopped, for a total of 2 hours 45 minutes. Two hours × 80 miles per hour is 160 miles. Because 45 minutes is 3⁄4 of an hour, you need to add another 3⁄4 × 80 = 60 miles, giving you 220 miles. 7. B. You know there are 24 hours in a day, so to find the number of hours in a week, calculate 24 hours × 7 days = 168 hours. Now you have 168w hours. Add 24d for the leftover days. Another approach: In w weeks and d days, there are 7w + d total days. Multiplying by 24 hours in a day gives you 24(7w + d), and distributing gives you 168w + 24d. the question asks you for the statement that isn’t true, you have your answer — Choice (A). When you take the real SAT, you don’t have to check every possibility if you’re pretty sure about your answer. If you finish early, you can always go back and double-check. can see, they’re equal. Choice (E) follows logically from the answers you got as you worked through Choice (D). 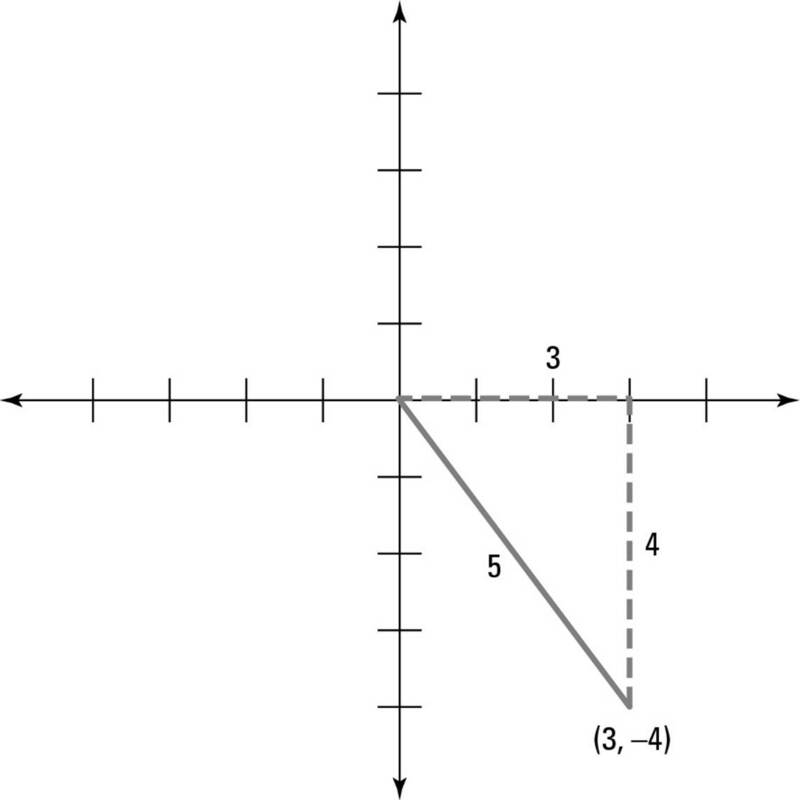 If both pieces of the line have a slope of 3⁄2, then so does the whole line AC. Notice, by the way, that you don’t add slopes as you would distances. 9. D. You could write an algebra equation for this problem, but reasoning it out works fine, too. The fraction of the tables that Nandan had to set up changed from 1⁄3 to 1⁄2. In math, change is always a cue to subtract, and 1⁄2 – 1⁄3 = 1⁄6. (Solve this without a calculator just for the practice.) So Nandan had to set up 1⁄6 more tables than he expected — 4 tables, according to the problem. If 4 is 1⁄6 of the total, then the total number of tables is 4 × 6 = 24. 10. C. Don’t waste your time trying to draw graphs to solve this problem. If the graph of an equation passes through a point, then the coordinates of the point are a solution to the equation. 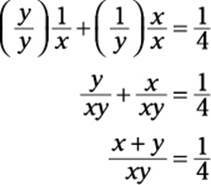 So you need to plug in –1 for x and 4 for y in each of the equations given in the answer choices. Solve the equations. In the equation in Choice (C), the key is that –(–1) = 1, so the equation becomes 1 + 3 = 4, which is a correct equation. Make sure you don’t mix up the numbers. For example, if you carelessly put –1 in for y and 4 in for x in the equation y = x – 5 in Choice (A), you’d end up choosing Choice (A) as the correct answer — and you’d be wrong! 11. E. LM is a diameter, which means it divides the circle into two 180° arcs. Because N is an inscribed angle (it’s on the edge of the circle), its measure is half of the lower 180° arc, or 90°. Yep, it’s a right triangle! Because you know the lengths of two sides of the triangle, you can find the third. Remember that 26 is the hypotenuse, so your equation should be x2 + 242 = 262, which gives you x2 + 576 = 676, x2 = 100, and x = 10. Now for the real problem — finding the area of the shaded portion of the circle, which equals the area of the circle minus the area of the triangle. The circle’s diameter is 26, so its radius is 13, and the area of a circle = πr2 = π(13)2 = 169π. The triangle’s area is 1⁄2 × base × height, but you need to be careful. Twenty-six isn’t the base because you don’t have a height to go with it. Instead, you need to use the two legs of the right triangle as the base and height. (It may help to rotate the book if you have trouble visualizing this concept.) 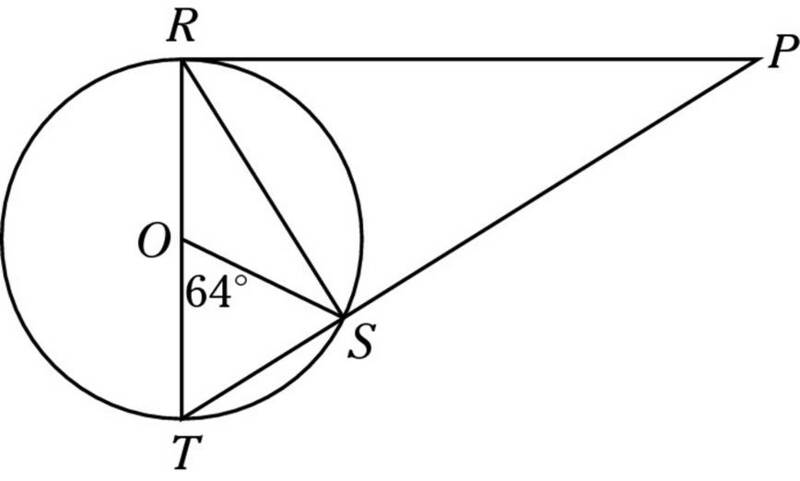 So the triangle’s area is 1⁄2(10)(24) = 120, and the answer is 169π – 120. 12. A. Start with the last fact given in the question, that the three-digit number ABC is divisible by 5. Every number that’s divisible by 5 ends in either 0 or 5, so C must be one of those numbers. The first and second facts make it impossible for C to be zero, because, if C were zero, Aand B would be equal to each other, which is illegal. Therefore, C must be 5. Because B = A + C, and A must be at least 1, B must be at least 6. 13. 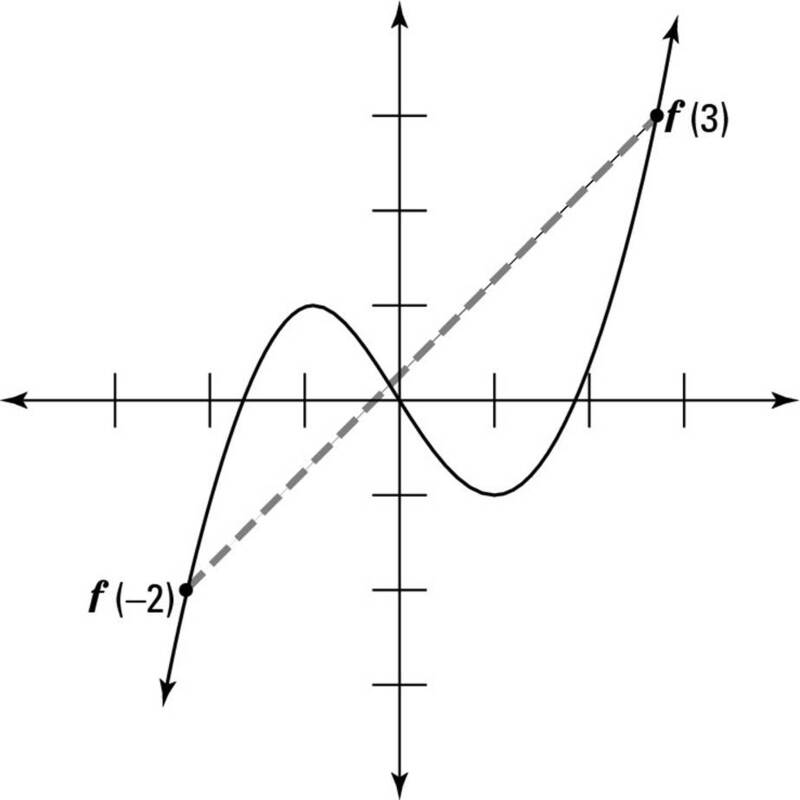 D. When f(x) = 0, the graph has a height of 0; in other words, it crosses the x-axis. As you can see from the graph, it crosses the x-axis in three places. Notice that you don’t actually need to know where it crosses the x-axis. You just need to count the number of times it does so. 14. B. Here you just need to move the graph down 2 spaces. After you draw the line, don’t jump the gun and start calculating the slope. Doing so is a waste of time because the question doesn’t ask for the slope. All you have to do is look at the graph to determine that the slope is positive and then mark Choice (A). To figure out what kind of slope a line has, imagine an ant walking on the line from left to right. If it’s going uphill, the slope is positive. If it’s going downhill, the slope is negative. The ant isn’t going up or down when the line is horizontal (flat), so a horizontal line has a slope of zero. And, finally, the ant could be going up or down on a vertical line, so a vertical line has no slope. 16. C. In case you didn’t already know, this question is tough. When a problem looks complicated, start with the simplest part you can see. In this case, the simplest part is . If you make a positive, the result must be less than 3. So a could be a number like 1, 2, 2.3, or 1⁄8, or it could be the negative versions of any of these numbers. So what can’t a be? It can’t be 3 or bigger than 3, and it can’t be –3 or less than –3. Okay, now it’s time to tackle . Start by plugging Choice (A), b = –8, into the equation. Then . If you try some possible a values, you see that you can’t make this equation equal less than 4. The same thing happens when you plug in Choices (B), (D), and (E). But if you try Choice (C), you get . Now if you let a = –2.5, or any number between –2 and –3, the answer is less than 4. Question 16 is a lot of work. On the real SAT, you probably want to skip a problem if it looks this time-consuming. Save your energy for easier problems, and go back to the really complex ones if you have time after you answer all the other questions. stand for the heights of the objects in question. Doing that crazy cross-multiplication thing gives you (11⁄4)(x) = (5)(7) or 11⁄4x = 35. Now don’t be scared: You have to divide both sides by 11⁄4, or 5⁄4. To divide 35 by 5⁄4, multiply by the reciprocal, or 4⁄5: 35 × 4⁄5 = 140⁄5 = 28. 18. B. The answer choices have only v and w in them, so you need to start this problem by turning everything into those letters. You already know that x = vw, so y = wx = w(vw) = vw2. To continue, you need to remember two things: First, the ws both have an “invisible 1” as their exponents, and second, you need to add exponents when you multiply powers of the same bases. Because z = xy, z = (vw)(vw2) = v2w3. You’re looking for yz, which your work tells you equals (vw2)(v2w3) = v3w5. 19. E. What a surprise: a special right triangle! ABD is a 30-60-90 right triangle, with ∠BAD measuring 60 degrees. Because AC bisects ∠BAD, both ∠CAD and ∠BAC measure 30 degrees. Hey! That makes ABC a 30-60-90 triangle, too! In triangle ABC, line AB is opposite the 60° angle, which means that it equals the shortest side times . The shortest side, BC, is therefore 5. And the longest side is always twice as long as the shortest side, so AC = 10. 20. D. Rick’s score was 9 (because it’s 4 + 5). For Jacob to have the same score, three times his lowest roll must also be 9, so his lowest roll must be 3. So he could roll a 3 and a 3, a 3 and a 4, a 3 and a 5, or a 3 and a 6. Ah, but be careful. To roll a 3 and a 4, for example, he could roll 3 then 4 or 4 then 3. Jacob can really roll 7 possible combinations: (3, 3); (3, 4); (4, 3); (3, 5); (5, 3); (3, 6); or (6, 3). So 7 is the numerator (the top half of the fraction). Now what? You have to find the denominator (the bottom half of the fraction), which counts the total number of possibilities. Using the counting principle, you multiply the number of possibilities for each action. In this case, there are 6 possibilities for each die, so there are 6 × 6 = 36 total possibilities, and your answer is 7⁄36. 1. D. The signal word here — the one that should light up in neon in your head — is though. Though (like its cousin, although) tells you that the sentence is changing direction. So right away you can rule out Choices (A) and (B) because their pairs are synonyms. Your next task is to decode the sentence. The first blank is about sharing — think common — and the second blank is about what isn’t shared — think unique. In case you were wondering, surmount means “to overcome,” and nullify means “to counteract” or “to undo the effect of,” as in this sentence: One burp was enough to nullify the impression of courtesy that Flink had been laboring to create. As you can see, neither of those terms fits the context of the sentence. Don’t be swayed the wrong way by one word in a sentence. In Question 4, heir may lead you to consider Choice (E) because you associate inheriting with money. But the rest of the sentence doesn’t support that choice. 5. B. Before you even looked at the choices, you probably thought of possibility or existence for the first blank because in the real world, not the SAT, people are always wondering about whether little green guys are wandering around the Red Planet. Keeping this fact in mind, you just need to decide between Choices (B) and (C). Choice (B) triumphs over Choice (C) because sustained (constant, unceasing) is better than advantageous (giving an advantage) in the context of the sentence. 6. C. Who makes a new broadcast network? Checking only the first blank, you can rule out only Choice (E) because despots are tyrants. Okay, maybe you’ve read about some of the media moguls and kept Choice (E). No matter. You still need to narrow down the field, and the second blank is where all the action is. The sentence tells you that the people who establish a new network must be businesslike and have one other quality. Chances are that other quality contrasts with businesslike or at least complements it. What’s a good pair for businesslike? Creative — which, by the way, is the opposite of prosaic (commonplace, dull). 7. E. This question relies on your vocabulary more than anything else. If a play is generic, it’s common, or not special in any way. Extraneous (extra, not essential) is way off base, as are intemperate (lacking self-control) and ubiquitous (appearing everywhere). The best choice here iscritical, which describes the kind of play (homerun, double play, spectacular catch) that the Yankees always make when I duck into the kitchen for a snack. 8. C. With so much experience, the interviewer has probably seen it all and then some, so seeing him or her nonplussed (rattled, shaken up) isn’t going to happen. 9. A. This question is a no-go for anyone who hasn’t swallowed a dictionary. For the rest of you out there: affable and amicable mean “friendly,” vivacious means “lively,” and malevolent means “evil.” If you crack the vocabulary code for the first blank, you’re still stuck for the second, which needs to match the first one in tone. Choice (A) fits because jocular is a fancy way for saying joking. If you’re friendly, you can still have mock arguments (during which you throw rubber frying pans at each other). Just to finish the word-building exercise: Sententiousrefers to arguments with a moral tone and innocuous means innocent. 10. D. Xenophobia is the Greek word for “fear of foreigners,” and if you’re afraid of foreigners, you don’t go abroad (out of the country). If you answered this one correctly, you’re definitely Ivy League material, whether the admissions officers realize it or not. 11. B. Choice (A) is too general, and Choices (D) and (E) are too limited because each applies to only one passage. The runner-up is Choice (C), but the passages say much less about why you want to know where you are and much more about how hard it was for early seafarers and pilots to navigate. For this reason, Choice (B) is your winner. 12. D. These two passages do in fact contain some inspirational material — the ability of human beings to rise to a challenge — so you may be tempted by Choice (A). But overall, they sound more like something a competent, somewhat-interesting science or social studies teacher would say while instructing you about longitude and navigation. 13. A. Passage I discusses the 18th-century problem of determining longitude, while Passage II deals with the early part of the 20th century. 14. B. This one contains a few sandbars that can run your SAT ship aground if you’re not careful. Choices (A) and (C) seem to be good options in terms of real-life experience because it makes sense that the water nearest land would be mapped, or charted, first. But the passage doesn’t give you much to go on, and the SAT doesn’t rely on real life, so you need to eliminate both options. Choice (D) doesn’t jibe with the passage, which refers to a course being plotted incorrectly, and Choice (E) has no basis in the passage at all. Thus, by process of elimination (and by looking at the passage), you know that Choice (B) is the best answer. 15. E. The paragraph preceding the sentence quoted in this question (Lines 11–20) discusses how easy figuring out latitude is. The lines after this sentence (Lines 25–45) explain why longitude is tough to calculate. This sentence, therefore, sets up the comparison. 16. C. Check out the fourth paragraph of Passage I, which explains the fact that 15 degrees equals one hour and the problem of keeping time after you’ve left your home port. These details point you to Choice (C). 17. D. Lines 40–41 explain that until 1761, “there were no clocks capable of keeping steady time on board a rocking ship.” Thus, you know that Choice (D) is the right answer. 18. A. The sentence about naval chronometers follows one that discusses telling time on board a rocking ship, strongly implying that these two topics are one and the same. 19. C. Crashing into locomotives and hills (Lines 52–54) certainly fits my definition of danger on the ground, so Choice (C) is the best answer. 20. B. According to Line 50, pilots descended in bad weather to continue following the tracks. In this context, landmarks is another word for tracks. 21. E. In the real world (not on MTV and not on the SAT), lighthouses are those cute little towers on seacoasts. According to Passage II, they light the way for planes, not ships. A typical SAT ploy is to lead you to the wrong answer by providing a logical (but wrong) real-world answer. Always choose your answer based on the information in the passage. The real world can help you, but the passage is always the final authority. 22. B. The third paragraph of Passage II goes into a lot of detail about the aircraft that “could beat the trains by two or even three days” (Lines 71–72) after lightways were constructed. So assuming that lightways made planes an acceptable alternative to trains is reasonable — unlike the present day, when you’re in the security line for three hours, only to find that your flight was canceled. 23. D. When the lightways weren’t visible, the pilots followed the tracks, which they illuminated with the landing lights at night, according to Lines 84–87. 24. C. Radio assisted, but didn’t perfect, navigation and thus made air travel easier — until someone invented those annoying background music systems that play in grounded airplanes (and elevators). 1. A. The tricky part here is the phrase “subtracted from.” “Two subtracted from five,” for example, means 5 – 2, not 2 – 5. Take care not to write (–8) – 10 for this problem. Instead, do 10 – (–8) = 10 + 8 = 18. A bunch of phrases signal subtraction — “subtracted from,” “less than,” and “fewer than” are the most common — and they all require you to switch the order of the quantities being subtracted. 2. D. Lyle’s cost is 2 packages × 10 pounds × $3.99 = $79.80. Gretchen’s cost is 20 pounds × $3.49 = $69.80, and the difference between them is $79.80 – $69.80 = $10. 3. B. Twenty minutes is one-third of an hour, so the minute hand covers one-third of a circle. Because a full circle has 360°, one-third of a circle is 1⁄3 × 360° = 120°. Adding in these three triangles gives you 13 total. 5. C. To solve this problem, you need to do a little estimating: π is about 3.1415; 31⁄7 is 3.142857; 3.14 is just 3.14; , and is about 3.16. Thus, 3.14 is the smallest. 6. D. Look first at the large triangle. You know one angle, 38°, and the other two angles are both equal to p + q. Thus, you can write (p + q) + (p + q) + 38 = 180, which gives you 2p + 2q + 38 = 180, and, finally, 2p + 2q = 142. At this point, some people frustrate themselves by trying to figure out what p and q equal. Unfortunately, you don’t have enough information to do that calculation; however, if 2p + 2q = 142, you can divide both sides by 2 to get p + q = 71. If you look at the little triangle, you realize that you now have all the information you need. Because the angles of the little triangle are a, p, and q, you can write a + p + q = 180; because p + q = 71, a + 71 = 180, and a = 109. 7. A. Two big things are illegal in algebra: You can’t take the square root of a negative number, and you can’t divide by zero. The denominator here is x + 2, which would equal zero when x = –2, so –2 is your forbidden value. out: x(a – b) = 2b. And, finally, dividing by a – b gives you , which is Choice (B). 9. 32. This question is best done as a proportion problem: . So 21⁄2x = 80. Dividing by 21⁄2 gives you x = 80 ÷ 21⁄2 = 80 ÷ 5⁄2 = 80 × 2⁄5 = 160⁄5 = 32. 10. 210. Every even number must be divisible by 2, so 2 × 3 × 5 × 7 = 210. 11. 360. This is an old semi-trick question: In any shape, the sum of the exterior angles is always 360 degrees. As long as you remember what an exterior angle looks like, you should ace this type of question if it shows up on the SAT. let the numerator equal n, then the denominator is 2n – 12, not 12 – 2n. Thus, . So, 2(2n – 12) = 3n, or 4n – 24 = 3n. Subtracting 4n from both sides gives you –24 = –n, and dividing by –1 gives you n = 24. But wait! That’s not the answer: n is the numerator, but the problem asks for the denominator. So plug 24 into 2n – 12: 2(24) – 12 = 36. If you have time, take a minute to check that 24⁄36 really does equal 2⁄3. This equation factors out to (p – 8)(p + 5) = 0. It has two solutions: p = 8 and p = –5. Because you can’t grid a negative answer, you have to go with 8. 15. 65. In this problem, you can’t actually figure out a and b. Because the problem asks for ­ a – b, one good way to start is to look for an angle that would be equal to a – b. First off, look at the angle marked p in the diagram below, in which p and b are vertical angles. Hence p = b. Now check out the (unnamed) angle where I’ve drawn a curve in the following diagram. Because this drawing contains parallel lines, this unnamed angle is equal to a; these angles are called corresponding angles. 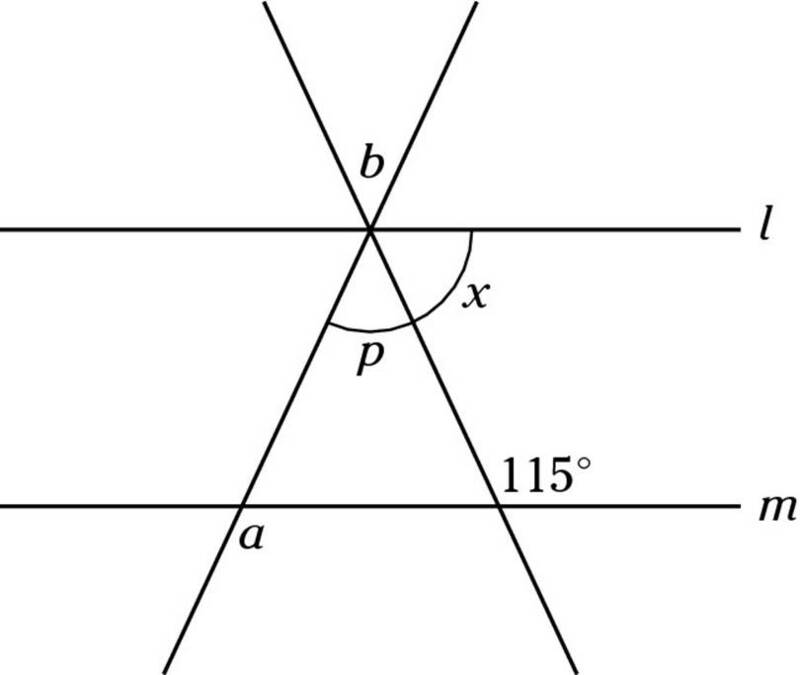 The angle marked x is equal to a – b. Again, you can use the properties of parallel lines: x corresponds to the (unmarked) angle right below 115°. Because this angle and 115° make a straight line, it must equal 180° – 115° = 65°. So x = 65, and a – b = 65. Your total is 9 + 180 + 2,700 + 4,044 = 6,933.
can write , so 4(x + y) = 120, and x + y = 30. The sides of triangle U are 11⁄2 times bigger than the sides of triangle T (because 15 ÷ 10 = 11⁄2). Now you need to remember an obscure (but important-on-the-SAT) fact: The ratio of the areas of similar figures is the square of the ratio of their sides because the area of a triangle is 1⁄2× base × height, and both the base and the height are 11⁄2 times bigger. So the area is 11⁄2 × 11⁄2 = 21⁄4 times bigger. And 84 cm2 × 21⁄4 = 189 cm2. 1. C. The expression “who had all paid high prices for the voyage” isn’t essential to the meaning of the sentence, so it’s considered to be extra. The rules of grammar tell you to set off extra information with commas. Choice (D) isn’t acceptable because that usually signals essential or identifying information, which appears in the sentence without commas. 2. B. The sentence indicates that the shortstop is on the team, so you must add else to the sentence. Are you confused about more and most comparisons? More does the job for comparisons between two elements; most describes the extreme in a group of three or more. In this sentence, the shortstop is compared to every other player on the team, but — and here’s the catch — she’s compared to the other players one by one. Therefore, more is the word you want. 3. D. The pair not only . . . but also needs to link two similar grammatical structures. In other words, the pair links expressions that match. Sipping doesn’t match if you pick, but sipping is a good mate for picking. 4. D. You need to delete the pronoun it from the sentence because, according to the grammar police, a pronoun may replace one and only one word (a noun). Choice (D) is better than Choice (E) because the adding was the wise move, not the chain. The possessive form (chain’s)correctly places the attention on adding. 5. D. Except is a preposition, so the expression is except Tomas and me. The pronoun I is only for subjects and subject complements. The pronoun me is the one you want for objects. 6. A. When you read this sentence, think tense (but don’t be nervous). The first verb, was, is okay because you’re just expressing an action in the past. The second verb, has been ­sitting, connects past (the last three weeks) and present (still there). Adding has to a verb connects present and past. 7. E. Who and whoever are for subjects and whom and whomever are for objects. In Question 7, all the verbs have subjects: slate means, voters may select, and they like. Because you don’t need a subject for any of the verbs in the sentence, you must need an object, or whomever (which is, in fact, the object of like). 8. A. Will have acquired implies a deadline, and the first part of the sentence supplies one: college graduation. 9. E. Who’s writing that good essay mentioned in the sentence? In Choices (A) through (D), the answer is no one, which, of course, can’t be correct. Choice (E) is the only one to include a writer — you — in the sentence. 10. A. Surprised by this answer? If you feel badly, your sense of touch is damaged in some way, or maybe you’re wearing mittens. If your mood is sad or upset, you feel bad. 12. C. Her father’s mother and her grandmother are the same person, so Choice (C) is repetitive. 13. D. The following expressions don’t exist in proper English: must of, should of, could of, and would of. You need to change the of to have. The confusion arises when you shorten the expressions, as in should’ve, which sounds like should of. 14. A. When a sentence begins with a verb form, the subject needs to be performing that action. In this sentence, the telescope is the thing doing the gazing. Nope! You need a person. Because telescope isn’t underlined, you need to choose the introductory verb phrase, gazing up at the stars. 15. E. Sometimes the hardest questions are the ones that have no errors because after a couple of SAT sentences, you tend to find mistakes everywhere. This one, however, is fine as is. 16. E. Another correct sentence. Yikes! Two in a row! Actually, I put these together to illustrate a point. Don’t try to find a pattern of letter choices; instead, look for grammar errors. By the way, if you chose Choice (A), you fell into a common trap. Take your finger and cover up we all know. Now read the sentence. Can you “hear” that “who is a great champion of the poor” sounds better than “whom is a great champion of the poor”? Whenever you see a self-contained expression, such as we know, I believe, or everyone thinks, cover it up with your fingers and see how the sentence reads without those words. Chances are you’ll find the real error, if one is present, when the distraction is removed. 18. B. However can’t join two sentences. You need to insert a semicolon before however or serve time for creating a run-on sentence. 19. B. Dump the word equally. The expression equally as is improper, according to the grammar police. As gets the comparison job done; you don’t need equally. 20. D. The director doesn’t object to the document but rather to the document’s being handled. The possessive — see that little apostrophe? — places the emphasis on being handled, where it belongs. 22. D. With either . . . or and neither . . . nor sentences, the verb must match the subject that’s closer to it. In Sentence 22, teammates is closer and must match have because both teammates and have are plural. 23. A. You can’t read and return at the same time, so the sentence should say, When the scholar had read. . . . The had places the action of reading before the action of returning. 24. B. The expression could not help is negative, and so is but. In Standard English, two negatives equal one positive. The correct way to say this thought is could not help wondering. 25. A. Farther and further look similar, but they have two distinct roles. Farther is for distance — and is, therefore, the correct word to use in Sentence 25. Further is for extra intensity. 26. E. Yes, this one is perfect, just like me, and, of course, you. 27. B. The committee debated whether, not as to whether. The as to here is unnecessary. 28. D. Here’s an affect that needs to be an effect. Check out the explanation for Question 21 for more information. 29. B. How many books have an informative table of contents and gorgeous pictures? According to the sentence, a few do, which means the that in the sentence is plural and takes a plural verb. When you see the only one that or the only one who, go for a singular verb after that or who. In sentences stating one of the ____ that or one of the ____ who, you probably need a plural verb. 30. D. Short but sweet gets the job done here, which is why Choice (D) is the right answer. The original sentence is wordy and relies on passive voice (should be considered) — never a good choice. Also, Choices (B) and (E) are wrong for this reason: Everyone can’t be paired withthey because everyone is singular and they is plural. 31. C. The original sentence is missing a subject, and Choices (B) through (E) supply one. Choice (B) is repetitive (unique means “can’t be duplicated”), and Choice (D) is wordy. Choice (C) is the most concise option, so it’s the best. 32. D. Choice (A) is a run-on sentence, and Choice (B) has a tense problem. Choice (C) makes sense grammatically, but and is the most basic joiner and can be improved using the structure in Choice (D). Choice (E) is wordy. 33. C. Each detail shows why foreign study adds to one’s education. 34. C. Choices (A) and (B) are too wordy, while Choices (D) and (E) are too minimal. Choice (C) hits the target right on the nose: It’s concise but complete. 35. B. The pronoun it is flapping around unnecessarily in Choices (A) and (D). Choice (C) is wordy, and Choice (E) provides no clear meaning for they. 1. C. If the number of tailors has gone from dozens to five, you’re looking for a word that means “decrease.” Naturally, the SAT writers have complicated the situation by including two choices, (B) and (C), that express a downward trend. Choice (B), however, refers to a decrease in age, as in a regression (movement backward) from adulthood to infancy. Choice (C) is the answer you seek. 2. A. The tour’s not moving, and the kid’s to blame. You’ve been there, right? You’ve seen the toddler with her heels dug into the ground, shouting, “Make me!” or something similar. So the first blank has to describe a child who won’t move. Choice (A), intractable (not budging), and Choice (D), recalcitrant (stubborn), both work. Now picture the parents in this situation. What are they unwilling to do? Indulge (give in) is the opposite of what you need, so Choice (D) is out. Choice (A), force, fits perfectly. 3. D. If the student is painstakingly going over every answer, he’s careful and working hard. Choice (D) — diligent — means exactly that. Even though you now know the answer, take a moment to build up your vocabulary: indolent means “lazy,” vigorous means “energetic,”imprudent means “foolish,” and lackadaisical means “having no daisies.” Just kidding — scratch that last one. A lackadaisical person is careless. 4. B. Which word describes people who won’t quit, no matter how tough things are? Choice (B) because idealists go to extremes. 5. E. This one contains a typical SAT trap. The sentence mentions an expanded population, so you may be drawn to Choice (A) because growth and expanded seem to go together. However, the sentence (and apparently the mayor) deals with environmental problems, or concerns, as expressed by Choice (E). 6. C. The important word in this short sentence is belied. If you know the meaning — to contradict — you immediately search for two words that are opposites. Two choices express opposites — (C) and (D) — but Choice (D) makes little sense when applied to a person, even though the sentence mentions countless photos. The blanks are talking about the star’s image, not where or how often the image is seen. 7. B. Line 8 mentions the “most unforgiving wilderness in the world.” As the rest of the passage makes clear, the fact that the difficulty “did not seem to trouble him much” says more about Franklin’s ego than the possibility of success. 8. B. The negative may have tripped you up here. Simpson is no light judge of character and reads Franklin accurately. In other words, he’s a good judge, not an insignificant one. 9. E. According to Simpson, Franklin wasn’t the sort to rough it. Though he was set to travel 1,200 miles, he couldn’t walk more than 8 miles on a good day. The tea example shows just how much Franklin needed to survive — the equivalent of requiring a whirlpool bathtub on a camping trip. 10. D. Choices (A) and (C) conflict with the content of the passage; Simpson thought Franklin was extremely unprepared, and the weather during the planned trip would be far from summery. Choices (B) and (E) are interesting but not really appropriate. How many SAT takers can relate to an Arctic voyage? And why should the reader sympathize with someone who set off without supplies? Thus, through the process of elimination, you know that Choice (D) is the right one. 11. B. The language of the quotation is appropriate for the early 19th century, but the passage begins by stating that it is Franklin’s admission (Line 22). This fact probably rules out Choices (C) and (D). Because no other author is cited, the most likely source of the quotation is Choice (B). 12. A. Franklin “threatened to ‘. . . inflict the heaviest punishment on any who should persist in their refusal to go on’” (Lines 36–38), but his threat was completely hollow (Line 39) because he was outnumbered. Because his men were hungry, you can rule out Choices (B) and (D). Choice (E) isn’t supported by any evidence. Choice (C) is tempting because Franklin didn’t take into account the Native Americans’ ability to predict the weather. However, he did consider their hunting skills, so Choice (A) is best overall. 13. D. That date is when the expedition came to an end (Line 77). 14. A. Franklin thinks, just like those guys on the radio (not to mention the Internet), that he can predict the weather with scientific instruments. Ha! Franklin ignores the experienced traveler (Akaitcho), who is proved correct by the cold temperatures. 15. B. The mutinies of the expedition were averted by the killing of a caribou (providing food) and Franklin’s decision to halt. Open fighting never took place. 16. C. The passage makes clear that Akaitcho was correct in his weather forecast. Not wanting to offend anyone, the SAT writers are extremely unlikely to place a negative comment about an ethnic group in the test unless that comment is proved wrong. 17. D. This one’s easy, unless you know something about weatherproofing that has escaped the rest of the human race (in which case you should drop the SAT prep and apply for a patent). If it’s 57 below, you’re in trouble — big trouble. 18. C. Choices (A), (B), and (E) are too general. Choice (D) is too narrow. Choice (C) is, in the immortal words of Goldilocks, just right. Title questions usually follow the pattern illustrated in Question 18. A couple of choices will be too narrow and a couple will be too broad. Look for something that covers all the information in the passage but not the entire universe. 19. A. Walked over any liquid rocks, lately? The world in Passage I resembles that of a sci-fi special. The exclamation point is supposed to underline the contrast between the real (non-molten) earth and the image of a melting planet presented in the passage. 20. D. Okay, melted rock is certainly hot, but Choice (E) doesn’t cut it because the word forbidding describes the world, which certainly sounds as if it possessed difficult characteristics. 21. A. Kant’s view is that the formless cloud would draw in on itself more and more until it would collapse to a point, an event that would end the solar system before it even began, certainly signaling the end of story for everyone and everything else. 22. D. A couple of the other choices are close, but Choice (D) fits best. Passage I talks about the early (very early) earth. Passage II hits the solar system at its beginning. 1. A. This one is pretty simple. Just multiply each way to score by the number of points it’s worth and add the three ways together. 2. D. The number 2 is prime, and 10 = 2 × 5, 15 = 3 × 5, and 57 = 3 × 19. Each of these numbers is the product of two primes. But 18 = 2 × 9 or 3 × 6, and neither 9 nor 6 is prime. Notice that you have four marks but five spaces (one between each pair of marks, including 13 and –2). The distance between the endpoints is 13 – (–2) = 15. Thus, each of the five spaces is three units wide. So from left to right, the four marks are at 1, 4, 7, and 10. Notice that I put 8 inches on two sides. Don’t write something like x + 8 = 40; a rectangle has four sides, not two. If you call the two missing sides in the diagram x, the equation is x + x + 8 + 8 = 40, or 2x + 16 = 40. Then 2x = 24, and x = 12. 5. A. You know that distance = speed × time, so Owen has traveled 3m miles so far. That journey leaves him with 400 – 3m miles still to go in 5 hours. Because distance = speed × time, speed = distance⁄time, and Choice (A) is your answer. , which is not 5. Hopefully, you recognize that the triangles in this drawing are both 45-45-90 triangles. So the hypotenuse — which is also the diagonal of the square — equals a leg times . 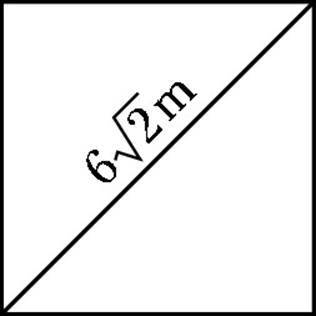 Because the legs are just the sides of the square, each leg equals 6 m, and the perimeter is 4 × 6 m = 24 m.
8. C. First, realize that this problem has two possibilities: an even number followed by an odd, or an odd followed by an even. If the first number is even, it could be 2, 4, 6, or 8 (four possibilities). The second number must then be 1, 3, 5, 7, or 9 (five possibilities). Using the counting principle, 4 × 5 = 20 possible numbers. If the first number is odd, it could be 1, 3, 5, 7, or 9 (five possibilities). The second number must then be 0, 2, 4, 6, or 8 (five possibilities); don’t forget about zero! So you have 5 × 5 = 25 more possibilities, for a total of 20 + 25 = 45 possible two-digit numbers. 9. D. Triangle I looks like a right triangle, but the diagram doesn’t provide any actual evidence that it is. Triangle II, on the other hand, has two angles that add up to 90°, so the third angle must be 90°. 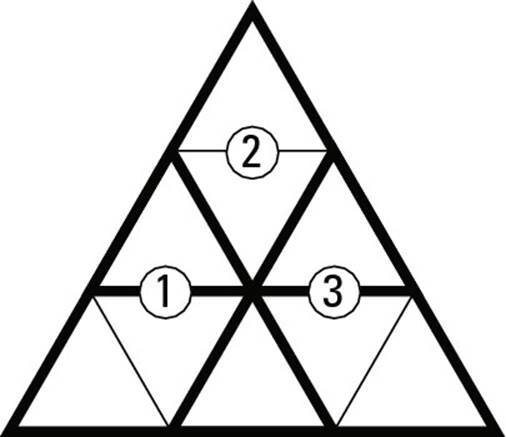 Triangle III has sides of 5, , and 6. You can test whether this triangle is right by using the Pythagorean Theorem: , which is 62, so Triangle III is a right triangle, too. 10. E. d1/2 is the same as , so and . This fact doesn’t mean that , but it does mean that d = 42 = 16. So d–1 = (16)–1 = 1⁄16. 11. D. For history and English combined, 8.5% + 10% = 18.5%. Next, 18.5% of 5,000 = 0.185 × 5,000 = 925. 12. E. Well, Choice (C) is obviously false, judging by the first graph. Choices (A), (B), and (D) all suffer from the same problem: You have no idea how many students attended State U in 2000. Comparing the number of people in each major in the two different years is impossible. The second graph shows that Choice (E) is true. 13. D. To begin this problem, I’ll try using 2, 4, 6, and 8 as my numbers to see what happens. Their average is (2 + 4 + 6 + 8) ÷ 4 = 20 ÷ 4 = 5, which isn’t even, so Choice (A) is false. The median is the middle number, but because there are four numbers in the list, you have to average the two numbers closest to the middle. Here, those numbers are 4 and 6, so the median is also 5, which makes Choice (B) false, too. Now, I’m going to skip to Choice (D) for a moment because it also deals with the median. Notice that whatever four numbers I use for my list, I’ll always have to do the same thing as I just did before: average the two middle numbers, which will give me a number that isn’t on the list. Therefore, Choice (D) is the answer because it’s always true. You may be wondering about Choices (C) and (E). They’re true for the list 2, 4, 6, 8, but they aren’t always true. For example, if you choose 10, 12, 14, and 16 as your numbers, Choices (C) and (E) are false. When you try to solve a problem with an example, as you did in Question 13, there’s always a danger that what works for your example won’t work for someone else’s. Be on the lookout! If you have time, try out two examples to make sure your answer works for all examples — and isn’t specific to yours. 14. C. Following the definition given in the question, >5 = 9, and >9 = 16, so 9 + 16 = 25. Now don’t go for the “obvious” answer, Choice (D), because >25 must be greater than 25. The correct answer is Choice (C) because 25 is the smallest perfect square greater than 20. 15. B. The first two statements aren’t unusual, but the third is a little weird. If you try a “normal” number, like 4, for j, then 42 = 16 and 43 = 64; notice that j2 isn’t greater than j3, so you know j isn’t a positive number greater than 2. What about a fraction, like 1⁄2? Then (1⁄2)2 = 1⁄4, and (1⁄2)3 = 1⁄8, and j2 > j3. But wait a minute: Now j2 and j3 are both smaller than j, which contradicts the first two statements. So how about a negative number, like –2? Well, (–2)2 = 4, which is greater than –2, but (–2)3 = –8, which isn’t. So you’re left with a negative fraction. Try –1⁄2: (–1⁄2)2 = 1⁄4, which is greater than –1⁄2; (–1⁄2)3 = –1⁄8, which is also greater than –1⁄2 because it’s farther to the right on a number line. And, finally, 1⁄4 > –1⁄8, so the third condition is satisfied, too. Thus, you have your answer: j is any number between 0 and –1. 1. B. When you run across a neither . . . nor or either . . . or sentence, look for the subject that’s physically closer to the verb. That subject rules: If the subject is singular, the verb has to be singular also. If the subject is plural, you need a plural verb. In Question 1, solar power is closer than windmills. Solar power is singular, so it requires the singular verb is. 2. A. Every message is singular, so it pairs nicely with the singular verb goes. Therefore, Choice (C) is wrong because it contains the plural verb go. Choice (B) messes up the preposition because material passes through a filter, not by one. Choices (D) and (E) fail because the pronounit may refer to either e-mail or inbox, and all pronoun references should be absolutely clear. 3. D. A person is a singular, third-person noun. (Third-person is the English teacher’s term for talking about, not to or as, somebody.) Any pronoun referring to a person must also be singular and third person. He or she (or it, which doesn’t fit the meaning of the sentence) are your pronoun choices, so Choice (D) is the best answer. 4. E. In the original sentence, the level of skill is wrongly compared to metalwork. Choices (C) and (E) express the intended meaning of the sentence, but Choice (C) repeats words unnecessarily. Choice (E) gets the job done without repetition. 5. C. Why complicate life? He’s hobbling along, but he arrives at his destination. How long did it take him? At least ten minutes, otherwise known as Choice (C). 6. B. An English sentence is a reasonable thing. All it wants is a complete thought expressed partly through a matching subject/verb pair. (Okay, it also wants punctuation, good spelling, and a time-share in Miami, but work with me here.) Choice (A) has two dependent ideas — “being part of the Halloween parade” and “which gives enjoyment to both spectators and participants.” Those dependent ideas can’t stand alone and be considered a grammatically correct sentence. Choice (B) creates a complete thought by changing being to are. 7. C. The original sentence isn’t wrong grammatically; it’s just clunky. (Don’t you love my technical term?) Choice (C) pulls the ideas together without fuss. 8. A. Yes, I actually threw in a correct sentence, as the SAT also does occasionally. The comparison — and the sentence — is complete in Choice (A). 9. D. What does the pronoun they refer to? The gardeners or the seedlings? As the sentence is written, they is ambiguous (having two possible meanings). Choice (D) clarifies the situation: The plants, not the gardeners, get a head start. 10. B. The words unconscious ways imply everything else that’s underlined in the sentence. Drop the unnecessary words and go with Choice (B). 11. C. When you’re describing an action, you need an adverb (quickly), not an adjective (quick). Anything that intensifies a description should also be an adverb, so really (an adverb) is appropriate, and real (an adjective) isn’t. 12. D. The expression for to isn’t Standard English, so you can rule out Choices (A) and (B). Choices (C) and (E) aren’t grammatically incorrect, but Choice (D) does the job more ­efficiently. 13. E. Use your reading comprehension skills to decide how many plants are in the category expressed by the underlined words — one or more than one? Logic tells you that more than one plant didn’t flourish (grow well). Because the underlined expression refers to many plants, thatis plural and requires the plural verb have. 14. C. What does the pronoun it mean? In general, a pronoun may refer to only one word. In Choice (A), it refers to an entire statement — “Colleges now offer students many more electives.” Incorrect! Choice (B) has the same problem as Choice (A) because which is also a pronoun and is governed by the same pronoun rules. Choice (C) clarifies the meaning of it by substituting the noun choices. Choices (D) and (E) are just plain wrong.